This book is in large format, making it suitable for presenting text along with photos and maps. The list of contents includes eight chapters, references, index and author’s biography, but lacks a list of figures. The book starts with a review of Lebanese geological literature, which has an intimate association with the development of natural resources. This starts with the earliest published observation on the geology of Lebanon, by Bottes in 1833, and includes the publication in 1955 of Louis Dubertret’s important Carte Géologique du Liban. The author concisely reviews petroleum exploration in Lebanon from the late 1940s to 1974, mentions the pioneering work of the late Ziyad Beydoun during the civil war from 1975 to 1990, leading to the author’s own work from 2000 to present, heralding the dawn of offshore exploration in Lebanon. A brief and informative review of the plate tectonics and regional setting of Lebanon and the surrounding Levant region is found in Chapter 2, including an excellent discussion of gravity anomalies both on and offshore Lebanon. This is followed by a comprehensive discussion of the structural elements of Lebanon, describing the two major topographic mountain chains of Mount Lebanon and Anti-Lebanon, which are separated by the Bekaa Valley. This chapter also includes full descriptions of the faults associated with the Levant Fracture System, folds and monoclines. All these structural features of Lebanon are supplemented by excellent cross sections and photographs. Chapters 4 and 5 deal at length with the lithostratigraphy of Lebanon from the Jurassic to the Pliocene succession, described thoroughly and supplemented by numerous field and petrographic photographs, charts, palaeogeographic and sediment thickness maps, all reflecting the tectonic development of Lebanon. The Geology of Lebanon (2014) Fadi H. Nader Scientific Press Ltd. A short review of the elements of the hydrogeology of Lebanon is given in the next chapter, with a concise account of the major aquifers in Lebanon, supported by rainfall maps and excellent photographs of karst features and springs. Palmyra Basin, Syria are discussed, supplemented by an excellent Triassic isopach map of the Levant region (compiled from Wetzel, 1974, and Beydoun and Habib, 1995). Petroleum systems onshore Lebanon are covered in depth with excellent maps, crosssections and photographs. The section on hydrocarbon prospectivity offshore Lebanon again highlights the Levant Basin as the current frontier gas province, and provides up-to-date dataand discussion on the subject including maps, cross-sections,charts and seismic profiles. Finally, the concluding comments in Chapter 8 describe Lebanon as “a beautiful country, rich in easily accessible features which demand to be visited, studied and understood”. This short book brought me, as an interested reader and worker on the petroleumexploration of the Middle East, to a quick understanding of many aspects of Lebanon geology as well as petroleum exploration. The compiled map on page 85, for example (Triassic isopach map of the Levant region showing the location of oil and gas fields, the extent of the Kurrachine evaporates, and the location of the wells producing from Triassic reservoirs), is an important reference for the exploration of the Triassic play in northern Jordan, southern Syria and the Golan Heights. The references list is comprehensive and very informative, particularly the published work of the author of this book from 2000 to 2011. 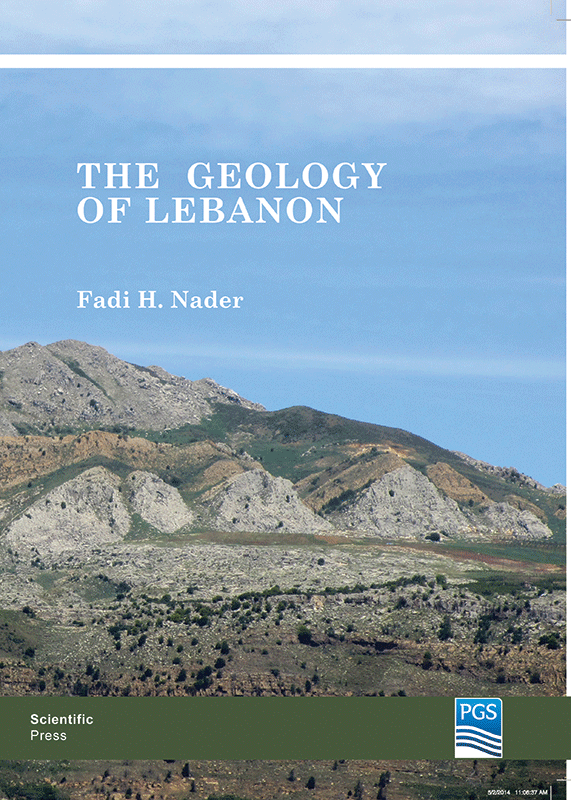 I highly appreciate this work by Dr. Fadi H. Nader, and strongly recommend this wonderful book to students of geology as a textbook on Lebanon, as well as a reference for exploration in the Levant region. The Geology of Lebanon (2014) Fadi H. Nader Scientific Press Ltd.